Over the course of the last 15 years, I have spent countless hours 30 feet above the ground clinging to a tree, perched on a small metal platform. To some this might sound like a torture device designed to elicit a confession to a certain devious deed. To bow hunters, we know this contraption as a tree stand, and there is no other place we would rather be. While sitting in my stand this year, I thought about the complexity of shooting from a stand. I reflected upon the knowledge I have garnered from both my successes and many failures when it comes to shooting from tree stands. I have read many outdoor articles that focus on stand placement, and hunting, but how often do we discuss the actual mechanics of shooting from a confined, elevated platform? It therefore seemed a great time to present some of what I have learned. This article is written with bow hunters in mind; however, many principles and ideas will translate towards rifle and crossbows as well. Some of these suggestions can also be used to shoot from a ground blind. I feel there are actually three stages in making a successful shot on an animal from a tree stand. The first stage begins when it's decided where to set your stand and includes how you actually set it. The second is practice, both before and during season, and the third is the mental aspect and physics of the actual shot. Elk at 9 yards. This is an example of setting a stand close. Often countless hours are spent locating a tree to place a stand in. This is obviously important as hunters want to be in a position where their prey will wander into the ambush. However, the success of our shot begins the moment we select and place the stand in the tree. If you have the choice of several trees to use, you want to select the one that gives you the closest shot to where your prey will be. We all know that the closer the target is the easier the shot is. Keep in mind that the closer you are, the more you should focus on scent, movement, sound, and camouflage. The price you pay for the close shot is the care you take in making yourself invisible. Care should also be taken to note the primary wind direction. One of the great commandments of archery hunters is to hunt downwind, and just because you are in a tree does not forgive a violation of the rule. Furthermore, always check for any major obstacles that may block a potential shot. Make the decision on whether or not you can remove an obstacle, such as a tree limbs or brush, or if you wish to leave them in place for camouflage. An example of setting the stand angled for a right hand shooter. Once you have selected your tree and started your set, it is very important to place the tree stand at the correct angle for the most commonly expected shot. This can often be overlooked and hunters will frequently set the tree stand so that they're directly facing the shooting situation. For right handed archers, the tree stand should be set as to present the most common shot to the left hand side. It is very natural to draw your bow facing the left and puts the archer in a shooting stance of being closed to the target. Left handed shooters should position the most common shot to the right side of them. Conversely you want the most unexpected shooting opportunity to be to the side that is most unnatural to draw your bow to. Recognizing that even if the archer is standing for the shot, there are sides of a tree stand you may not be able to draw from and successfully shoot to. Bottom line, make the expected shot the easiest and most natural to perform. enough obstacles for a shot. Once the stand is set, strap in and sit down. Take your time to observe your surroundings and shooting lanes/opportunities. Now is a great time to remove limbs, and clear shooting lanes. I like to take along a pole saw with me that allows me to trim high branches easily. If you have the ability, it is a great thing to take your bow and a shooting bag along with you on your tree stand setting adventure. After you have cleared your lanes, set the bag out where you anticipate the shots will be and shoot from the stand. This will give you a chance to check clearances of your bow limbs and you draw arm against the tree. Remove anything that will interfere with your shot. We all know the importance of practice, and I would suggest that this is one of the most important factors of bow hunting. Daily or even weekly practice at the bow range for several months before season is perhaps the greatest thing we can do to prepare for a tree stand shot. I always shudder when I hear archers tell me they hit the range for the first time, two weeks before season. This remark is usually followed up with something like, "Yep, I took the bow out of the case, shot some arrows and the pins are still right on. I am good to go." This statement is only partially correct: the bow is ready to go, but are you? Your archery muscles and mind have just spent the last 11 months on vacation. They need lots of work and repetition to get back into shape before hunting. Shooting at an animal with a bow from a tree stand can be one of the most difficult shots you may make. Honor the animal, and be the best prepared you can be for it. Also, make sure in your practice routine to add in seated and odd angled shots. Shoot from all position you can to become comfortable with awkward shooting situations. Make sure to maintain proper shooting form and do not sacrifice accuracy. If you can find an elevated platform to shoot from, use it! Shooting steep downward angles greatly changes the trajectory of your arrow. It is best to know the difference in arrow flight before your moment of truth arrives. I personally use my second floor deck and shoot down into the grass of my backyard. It works great, except for the odd look or two from the neighbors. Let me ask you a question: How many practice arrows are in your hunting quiver? Often I get confused replies from archers when I ask them this. They wonder why I would carry practice arrows to my tree stand. It is a simple answer: to practice with. We shoot all summer long, and there is no reason why we should stop once opening day dawns. Furthermore, there is no better preparation for a shot than having already made that exact shot that very same day. The first thing I do after strapping into my tree stand is shoot several practice arrows into the ground where I anticipate the animal could be. This not only builds my confidence, but it also confirms there are no problems with drawing the bow in my stand, or any equipment interfering with the shot. Recently I made a practice shot from a stand with my longbow. The arrow flew highly erratic and I found that one of the strands on the bow string had separated during transport. I retrieved my spare string from the quiver and continued hunting. If I had not made that practice shot, I could have missed an opportunity on an animal. Some further tips on practice arrows: Some people worry about animals smelling the arrows on the ground when they approach. I agree this is a rational fear. To overcome this I spray scent of the animal I am hunting on the feathers of my tree stand practice arrows. The result of this is two fold: not only does it disguise the human scent, but it can stop the animal when they smell it and possibly give you an excellent shot. Don't believe me on this one? 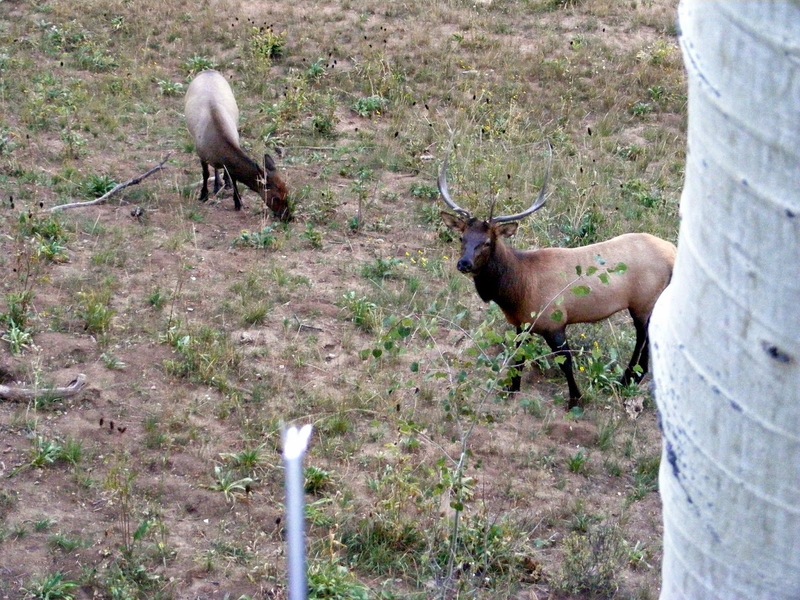 Check out the video below that shows a cow elk smelling my practice arrow at 26 yards. I sprayed elk urine on the feathers before the shot. Lets face it. Even the most experienced hunters get a rush watching an animal walking into their ambush. The adrenaline dump and anticipation can almost be debilitating for some. Novice bow hunters often report believing or even being physically unable to draw their bow when the shot arrives. This is even after shooting hundreds or perhaps thousands of arrows in practice sessions. All of that preparation is gone in an instant and some how the shot is either passed up, or is rushed and botched. Hunters do not even remember letting the arrow go and can not believe they missed a buck at a mere 10 or 20 yards. It just seems inconceivable. You sometimes will hear this called "buck fever", or "target panic"
The solution is to break your adrenaline-influenced thought cycle and focus on the mechanics of your shot. If my thoughts were spoken out loud as an animal approaches my stand they would sound something like: "stay calm, breath, pick your spot!" Once the shot arrives, I pause and think, "draw to anchor, aim, aim, aim, release." Now I am a traditional archer. As such, if you shoot a compound or rifle, you may have some different shot fundamentals. The important thing is to slow down, stay calm, and work through what you have practiced. The shot itself should be a conscious decision, as opposed to a reaction to the stress or fear of missing or hitting the animal. Take your time, aim on the exact spot you wish to hit, and release only when you are confident in the shot. Should you stand for the shot or remain sitting? This thought can be debated in the hunting community. My answer is both! I prefer to shoot from whatever position is accurate, yet requires minimal movement and noise to prepare for. Often this is from the seated position, but at times I have been standing when the animal appears and choose to shoot from there. Many seasons ago a cow elk walked into 15 yards and gave me a perfect broadside shot. The elk heard my clothing rustle when I stood for the shot and bolted, leaving me feeling ill prepared. Since then I purposefully set tree stands to allow for seated shooting. I prefer to shoot from the seat of my tree stands and often practice in the off season shooting while sitting on a bench. If you decide to shoot while seated, it is imperative to practice and check to make sure there is enough clearance between the elbow of your draw arm and the tree. Knowing the distance of your shot is paramount to hitting the animal. It is very important not to guess the distance. A matter of a few yards could mean a miss, or worse, a lingering wounding of your prey. Range finders have dropped drastically in price and are worth every penny you spend on them. It is still great to exercise and train in the skill of distance estimation, but when shooting from a set location there is no reason you need to. I commonly find or even create landmarks around my stands that will allow me to know any distance as a glance. When I talk about hunting a stand you might hear me use words like, '"the 26 yard rock," or 'the 30 yard tree." I sometimes make a game of it to pass the time. I will range find many objects around me, and then quiz myself while rechecking the distance. If this is not your style, I know one hunter who used chalk and spray paint on trees to mark them. Different colors meant different distances, green for 20, red for 30, and yellow for 40, etc. Why these colors? Because they matched the colors of the sight pins on his bow for the corresponding distance. Lastly, you need to take into account the angle of shot placement on the animal. Your arrow will be entering high on one side and exiting low on the other. Heart shots can be tricky if you aim directly for it, as you can actually pass below the heart itself. I highly recommend aiming for a double lung hit, since it is a bigger target and puts the animal on the ground just as quickly. Hunting from tree stands can be a very rewarding adventure, and I hope you enjoyed this article. If I had to sum it up in one sentence it would be this: Practice, take care when setting the stand, pick your spot on the animal, and stay calm. Closing thoughts this time are my own. It is a saying I have coined around camp and sums up my thoughts on becoming a successful hunter. "Hunting favors the persistent and prepared." about this,so i hope please review this topic.thanks. Great information that i got here and got update resources.